We took a bit of a detour last week in our search for affordable living for retirement. We had been focused on finding a smaller home in St. Augustine as our base. But seemingly overnight, house prices have gone up. It may be just a temporary bubble, but it is no longer a buyer’s market here. So our house search is on hold. Meanwhile, we are still looking at how to pull off the second phase of retirement living: where we will be when we are not at our base. We love our teardrop trailer, and it is perfect for short get-a-ways, but we don’t picture living in it for weeks at a time. We don’t want to own a second home for several reasons: the expense and headache of buying and maintaining it, and the wanderlust that calls to us from different parts of the country. For now, we have ruled out a larger trailer, even though I covet vintage Scottys and Shastas and Casitas. Same for a tiny house on wheels. Dale’s opinion is that he wants more flexibility than a trailer, even a small one, allows. He’d like to easily pull into a major city or stop for the night at a tiny inn. And he’s a Jersey boy - constant towing is just not in his blood. Our compromise is a camper van, which is not as simple a compromise as it sounds. It used to be, if you were a hippie you got a VW camper and if you loved country music you got a Chevy conversion van. Those lines have blurred today, and there are almost as many camper van options as there are baby boomers. 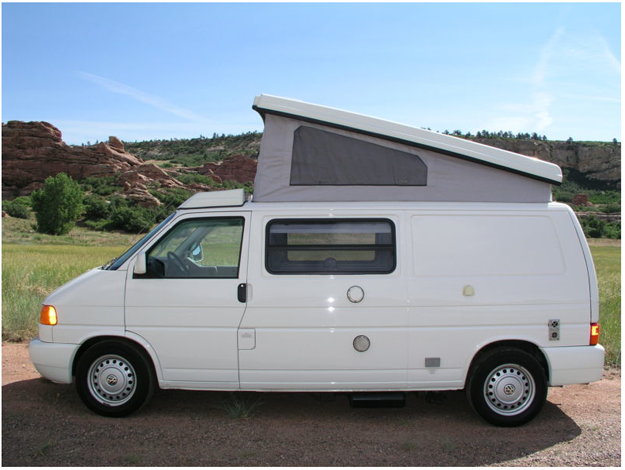 My favorite, VW campers, haven’t been available new in the US for over a decade. But when I took a break from writing this post to attend the memorial celebration for my friend’s mom, I bumped into someone I had not seen in 15 years. She was back in town after living on the West Coast for years in her 2002 VW EuroVan camper. And she is considering selling it…just a little more St. Augustine synchronicity. It may not turn out to be the right choice for us, but it sure is fun to think about.